We’d love your help. 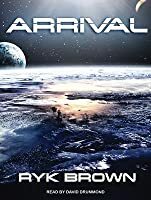 Let us know what’s wrong with this preview of Arrival by Ryk Brown. The Eden Project was a dream. Three generations, born and raised on a starship hurtling through space. To never witness the sun rise or set. It is up to the advance team to set foot on each of these worlds, conduct their s The Eden Project was a dream. It is up to the advance team to set foot on each of these worlds, conduct their surveys, and send their findings back to the colony ship. Everything must go as planned, for the welfare of all the colonists depends on them. “Arrival” is a 170,000 word, stand-alone novel. To ask other readers questions about Arrival, please sign up. What does ATC stand for? What are the ages of the landing team members? Pulp grade sci-fi. I can suspend my disbelief as much as anyone else but the author doesn't even try. Antimatter drive - fine, 40% light-speed - sure, I don't mind. There is a line however between implausible for lack of current scientific knowledge and just straight up crazy stupid. They arrive on some random planet that happens to have breathable atmosphere, edible vegetation, recognisable animals complete with viruses (with magical side-effects) that affect humans. The military personnel beha Pulp grade sci-fi. I can suspend my disbelief as much as anyone else but the author doesn't even try. Antimatter drive - fine, 40% light-speed - sure, I don't mind. There is a line however between implausible for lack of current scientific knowledge and just straight up crazy stupid. They arrive on some random planet that happens to have breathable atmosphere, edible vegetation, recognisable animals complete with viruses (with magical side-effects) that affect humans. The military personnel behave like a bunch of 10yo boyscouts on a hiking trip. I read sci-fi pulp from several decades ago with better science. I was 9 out of 17(!) hours into this audiobook last year when my Hoopla app abruptly stopped working. The issue was finally resolved a few months ago, so I figured, why not get back to this sci-fi tale. It's a longggggg book ...and it had no reason to be. Maybe the folks over at Hoopla were trying to tell me something. Author Ryk Brown's writing is painfully descriptive; he sets out detailing every single character action--opening a door, getting out of bed, looking in the mirror, putting on shoe I was 9 out of 17(!) hours into this audiobook last year when my Hoopla app abruptly stopped working. The issue was finally resolved a few months ago, so I figured, why not get back to this sci-fi tale. It's a longggggg book ...and it had no reason to be. Maybe the folks over at Hoopla were trying to tell me something. Author Ryk Brown's writing is painfully descriptive; he sets out detailing every single character action--opening a door, getting out of bed, looking in the mirror, putting on shoes--but the action never propels the story forward. When you look at the sum of the story, all 17 hours could've been boiled down to pretty tight, entertaining short story, an hour and a half at most. That's a hell of a lot of missed editing opportunities. The premise sounded solid: The earth is past its prime, with only a bleak future ahead of it. A group sets out on an interstellar voyage to explore one of three potentially hospitable planets in the Tau Ceti system--about seven months ahead of a group of settlers--in the hopes of determining which planet to colonize. I was disappointed with how little time was spent explaining why planets in the Tau Ceti system might have an Earth-like environment. We just jump right in and assume that readers will be on board in believing Tau Ceti 5 has edible animals and fauna, a breathable environment, and similar topography to Earth. I'm no expert in space or sci-fi, so for a good portion of the audio, I thought the reader was saying some make-believe word, "Tau City." It wasn't until this year, when I read another book (I think it was Le Guin's The Dispossessed) that I realized Tau Ceti was a real star, 12 light-years from our Solar System, with five planets orbiting it--two in a potentially habitable zone. ...this would've all been welcome knowledge (couldn't Brown remove some of the shoe-tying-talk and focus more on science? ), and would've helped me take the environment more seriously. It also didn't help that the whole crew of the ship behaved like a bunch of immature assholes: from their dialogue to their actions, to their very final decision. Holy eff, did I hate this entire crew. This review has been hidden because it contains spoilers. To view it, click here. This is a difficult book to review because I went into it with the wrong expectations. In the first 20 pages I thought it would be like The Marian, but with more people surviving. It wasn't, and the complete disregard for logic and sound science really turned me off (really, there's not a single communication-capable satellite in orbit despite the fact that the crew have detailed satellite imagery? And no one thought that sending a rover ahead of time might be a good idea? Or that sending a sing This is a difficult book to review because I went into it with the wrong expectations. In the first 20 pages I thought it would be like The Marian, but with more people surviving. It wasn't, and the complete disregard for logic and sound science really turned me off (really, there's not a single communication-capable satellite in orbit despite the fact that the crew have detailed satellite imagery? And no one thought that sending a rover ahead of time might be a good idea? Or that sending a single crew of misfits might not be the best plan?). If you want more Martian, this isn't it. In the next two-thirds of the book, it was basically Deepsix from The Academy series, minus the wonder and Hutch. A team of supposed scientists repeatedly do really stupid things and get themselves into trouble as a result... On a planet that's so unimaginatively Earth-like it may as well have been made specifically for humans. This part of the book is really more about the characters and their interpersonal relationships than about survival, exploration, or more hard sci-fi themes. Then the last third of the book turned into... I don't even know how to describe it. An examination of man's bond with nature and the meaning of belonging, encapsulated in a completely unexplained physical transformation. The last pages were heartbreaking and well-written, but I just kept asking myself, "Why? How? This makes no sense!". Warning: you won't get any answers. The plot seemed cool at the start, but the characters were not appropriate for the roles the author put them in. Captain Jake (original) who has more training than anyone else (Unlikely) and cannot delegate. The Second in Command is the least experienced out of the all but questions everyone (Unlikely). The Maintenance expert is a chauvinist pig, but has a soft gooey inside. The Medical expert is a stereotypical "motherly" type for the team and apparently a geneticists. The Agricultural expert is a feminist who hates to be lead around by men unless she is desperate and then she turns into a housewife (Unlikely and sexist). The rest of the team are also as stereotypical as can be. Our small team of "experts" are sent to a new solar system to find a habitable planet for their ark spaceship; home to hundreds of humans set to arrive soon. After the exploration ship miscalculates their speed, they have to airbrake hard around the first of three planets they are supposed to explore. As with any major undertaking, something bad comes up. Equipment failures, Natural disaster, Human error. Because of this oversight, our team now is faced with life or death. From this point on, they do one stupid thing after another for no apparent reason. If you are looking for a book that explains how a professional team of experts handle a crisis, stay away from this book. If you want to read how a random group of inexperienced "Joe's" navigate surviving on a strange new world this is for you. A story about humanity reaching a new planet in the hopes of colonization - sound familiar? Yes, this has been done before but this book actually does it quite well. You get a bit of life on the spaceship, a dramatic landing, and the efforts to survive. There are likable characters, a bit of humor, and plenty of adventure. And you get a surprise, although you'll probably figure it out well before getting to the end. But still, it is touching when it happens. Honestly, movies have ruined me because I couldn't keep the images of the Na'vi out of my head (from Pandora). They aren't even furry but the common blue color just lodged that picture in my brain! I wish half ratings were possible. I'm rounding this one up. I downloaded this from Hoopla before a road trip thinking it was the book the movie was based on. It turned out not to be, but it's an interesting story. Some things were pretty original and engaging though the first half was significantly better than the second. The prologue would have been better served as an epilogue. This book has problems, but I gave it five stars because I enjoyed it as much as I've ever enjoyed any book, which means more than anything else. That's what books are for, after all. Not to be perfect, but to make people feel, to let them live in another world, and to give them enjoyment. So five stars it is. None of the book's issues kept me from enjoying it. I'll start with the problems. First, it's hard to get through the beginning. It is a very extended scene in which the crew of an explorat This book has problems, but I gave it five stars because I enjoyed it as much as I've ever enjoyed any book, which means more than anything else. That's what books are for, after all. Not to be perfect, but to make people feel, to let them live in another world, and to give them enjoyment. So five stars it is. None of the book's issues kept me from enjoying it. I'll start with the problems. First, it's hard to get through the beginning. It is a very extended scene in which the crew of an exploration craft crash lands on a planet. After a few pages, it was like, "Okay, I get it, things are going wrong, blah blah, how much more of this do I have to slog through?" The answer is...a lot. If I had it to do over again, I'd skip the entire crash landing scene and start when they're already on the surface. It's well written, it's just too long, and it's the sort of predictable "everything that can go wrong does" stuff that is a tired trope in fiction. In addition, the plot elements are simplistic and you can tell from the writing and/or editing that this is a self published book that would never have been allowed to see the light of day had it gone through the traditional publishing industry. And that is why the traditional publishing industry can go to hell, because this book is fantastic. It may be simple, but it is a great story. Once the crash landing was done, it kept me engrossed the entire time. I read slow, and so sometimes I loose interest in books that are paced too slowly or have characters I don't care about. This book never lost me, I always wanted to come back to it. Some of the characters are hard to distinguish from one another, but not the important ones, so I didn't care. I loved the exploration and "survive on an alien world" bits, as that is my favorite type of science fiction. Politics-in-space and ugly-side-of-humanity-never-changes stories like The Expanse are great too, but sometimes you want a good old fashioned space/alien world exploration story without the usual space opera elements. The first part of story does not mesh with the rest. It seems to be someone spying on a woman who’s just found out something that has devastated her. By the very end of the book this will make sense, but frankly it’s so far apart that I found the piece openly annoying at first because it was so coy with details. By the end it was shrug-worthy because that first piece didn’t tell us anything that we didn’t learn later. It adds little and increases initial confusion. At least if it had come last t The first part of story does not mesh with the rest. It seems to be someone spying on a woman who’s just found out something that has devastated her. By the very end of the book this will make sense, but frankly it’s so far apart that I found the piece openly annoying at first because it was so coy with details. By the end it was shrug-worthy because that first piece didn’t tell us anything that we didn’t learn later. It adds little and increases initial confusion. At least if it had come last then it would have made immediate sense. Particularly toward the beginning of the book, many of the characters (especially all the woman excluding the doctor) act like children. It’s hard to imagine how someone could have thought that these characters could possibly accomplish this mission. All the women whine and complain. Some of the men are assholes. There’s a situation where a woman may well have a broken rib, but the man she’s stranded with makes her do a lot of crap work because she was rude to him. And she seems to take this as her due (although with some grumbles), as though being mean to him was something that should be punished with pain and possible further injury. This section in particular really grated on me. Most of the characters are pretty shallow, and some of them are oddly unobservant (a character notices that his hair is turning blue and doesn’t seem to think anything is weird with that). When one woman manages to become drunk on virtually no alcohol, she acts and talks like a three-year-old (“Are you takin’ a wee-wee?”). We do eventually get a glimpse of the Daedalus, and every person who speaks up seems completely stereotypical and shallow. It seems like the landing ship these guys used was practically designed to fail catastrophically. However, the inevitable landing calamities are handled well as tension-builders. Once everyone sets up a perimeter alarm, there’s no explanation for how a local creature gets past it without setting off the alarms. The survivalist plot core is interesting and captivating. (I admit to a fondness for survival plots.) I just wish the characters measured up to that. When dealing with Sara and Mac being stranded by a sudden flood, I actually so disliked the stranded characters and how they handled this plot twist that I wrote “I hate these characters” in my notes. The survivalism was handled well and was fun to read, but the character issues were so terrible that I couldn’t justify a rating higher than two. I was very impressed with Ryk Brown's latest scifi novel... I have read all of his books, from the mediocre to his brilliant action packed and super fun Frontier Saga. 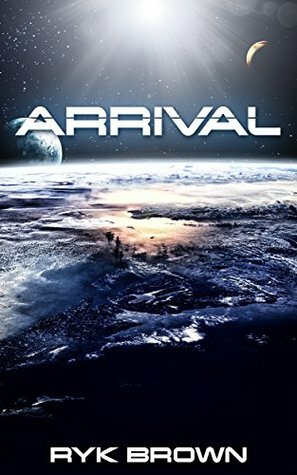 But what "Arrival" lacks in action (at least in comparison to the Frontier Saga, which is practically pure action), it makes up for it with a very realistic story about Earth seeking out a new home across light years and 4 generations of explorers in the hope of beginning civilization anew with a fresh start. It has action, love, adventure, metamorphosis, survivalism, humor, friendship, a killer plague, new strange life, and a touch of philosophical introspection about how we live today and where it might take us if we don't wake up and change before it's too late. This novel marks a new chapter in Mr. Brown's career - one that shows a sense of maturity, balance, depth and finesse that is rare to find in today's active scifi authors. Every now and then you pick a book from a new author or even one you know quite well and realize you have a gem. Same thing happened when I first read Andy Weir's "The Martian", James Corey's "The Expanse", or most any book by John Scalzi, to mention some recent writers I've read. I have enjoyed Ryk's Frontier saga so knew that I would be interested in this stand alone book. I just didn't know how much. Wonderful character development and fascinating storyline and such a g What an excellent read! I have enjoyed Ryk's Frontier saga so knew that I would be interested in this stand alone book. I just didn't know how much. Wonderful character development and fascinating storyline and such a great break from the space opera's I've been reading lately. He has wrapped this story around mans first step on a new world they hope to colonize. What wonders or horrors will await them? Always a fascinating part of any book or series and Ryk has woven an exciting ,yet bitter sweet tail centered solely on this aspect of exploration. First crisis comes along, and all of the characters are behaving like untrained passengers on a long distance busride. Really? This is the best that humanity has to reach out to the stars? Planetside, and one dumb decision after the next. I understand that if you let one character do something stupid one time, you have a useful line to hang a story on. Once. But every flipping chapter? No. Just no. 2.5 maybe even a 3, but someone needs to curb the unrealistic reviews. I hate it when I don't enjoy a book that so many others do like, it makes me feel like I'm missing something. This book was pretty boring, the dialog and situations seem forced, the science is crap, and unless I missed it there is never a reference to the character's ages. Ryk Brown's Frontiers series is pretty awesome, so I don't know what happened here. I don't care for the narrator, he makes all the characters seem really o 2.5 maybe even a 3, but someone needs to curb the unrealistic reviews. I downloaded this story by accident, believe it or not. But, it was bedtime, I had nothing to read , and WTF, I usually go to sleep pretty fast, so I just went with it. Well, I stayed up late that nite, and used some daylight finishing it. I liked it, and would recommend this story to anyone. Un-good. Don't understand the high reviews unless some sort of racket is going on. Childish, annoying and unrealistic characters with behavior and responses that don't match the situations they are in. Everything else is of bad 80's cartoon literary quality. Don't waste your time on this unless you have time to waste. A great old fashioned adventure mystery - tightly paced, interesting characters, emotional well written ending - I was left with warm thoughts of these individuals' futures - what would they be like? How would their experiences impact their descendants? Just couldn't go past the first hour of the Audiobook. Characters behaved very child like for a crew of elites and it just didn't work for me. Best science fiction I've read so far. Like many other reviewers, I cried at the end. Opened my eyes to the humane aspects of space travel. Well worth the read! Good premise, needs a prequel, would love more about the back story of the people who fled earth. This review has been hidden because it contains spoilers. To view it, click here. I really, REALLY wanted to love this book. I tried very hard to love this book. I kept reading it every day based on the pure hope that I would love this book. I never grew to love this book. This is your general sci-fi space colonization/survival story, with tons of great twists and ideas that seemed to be half thrown together at the last minute without strong connections or logic holding them together. In other words, this was a great idea that was tragically wasted. The plot connection I really, REALLY wanted to love this book. I tried very hard to love this book. I kept reading it every day based on the pure hope that I would love this book. The plot connections. The plot had great, GREAT potential, but it was poorly executed. I mean, c'mon, ape-like aliens that are semi-intelligent, but the colonists show absolutely NO interest in them. Nothing more than simple shoulder-shrugs? No. That would have been a top priority in a real colonization situation. They would have went out to capture one, or attempt contact with one, immediately after Mac reported it. Also, the one that sneaked into the camp didn't set off a single perimeter alarm, yet Jack did when he passed the perimeter. Also, what's up with how Laura noticed the genetic mutations in her specimens? How do you detect mutations when you don't have an original? And, why was Jack turning into the beast after being in contact/injured by one without getting sick (presumably because of the roots), yet the other crew members were able to stop death with the roots and stop their transformation into the same creature that Jack became? There was a huge lack of development in that plot point, which was an extremely important plot point. If the root stopped the other crew from both dying and becoming the ape-like alien, why didn't that work for Jack? It just didn't add up. Horrible dialogue. Just...terrible. The characters are shallow and reminiscent of 9th grade English level of writing. I know that's harsh, but seriously. The dialogue is completely unrealistic and includes too much petty talk. Ryk even writes out the characters walking into rooms and greeting each other, leaning against walls and just completely unnecessary information. Outside of the unnecessary adverbs, the dialogue is hard to follow at times. When three or more characters are involved in a conversation the dialogue runs from line to line with no dialogue tags whatsoever, leaving the reader to have to go back 10 lines and count out (Jack, Frank, Jack again, Frank again, now Maria, is this Jack again?, maybe Maria now?). It's super frustrating. Then, the dialogue is unrealistic. There was a point in the story where an engineer (Frank) was talking with the lead doctor with a background in bio-engineering/genetics about the sickness everyone was contracting. Repeatedly Frank would say, "Engineer here, I'm not following you" when Maria would use extremely simple terminology like "molecular bonds" or "proteins that make up the DNA strand". I'm sorry, an engineer would understand precisely what molecular bonds are or a DNA strand - that's freakin' basic science in high school, let alone specialized training for engineers selected to go colonize a planet. Then, to top it off, Maria broke what DNA does down to him on a level I'd talk to my 6 year old. "So, imagine you have to fix a machine, and the instructions are all jumbled and garbled," Maria tells Frank, regarding how DNA works, because he can't seem to grasp it. I almost deleted the book from my Kindle right then...but since I was so close to the end, I kept going. Horrible character behavior. If these were a bunch of people thrown together from your everyday population on Earth, I could maybe...MAAAYYYBE see some of the behavior. But these are self-proclaimed scientists that hold multiple degrees, with years of sim training, and decades of time travelling through space to learn. The entire mission is botched only because they behave like a bunch of mid-puberty teenagers, especially the women (except the Dr.) and most of the men, outside of Jack and Frank (most of the time). For highly educated, trained, and experienced people, they do the most idiotic and ridiculous stuff imaginable, like sneaking into a hut with an alien without weapons or protection, or seeing their own blue hair and not questioning it, or going off in groups of two (something no highly-trained survivalists would do), or bickering over idiotic stuff like little babies. Characters are too stereotypical. Mac the jackass jock, Sara the whiny feminist who at one point felt the need to flip out on a guy who saved her life from a flood, but accidentally cracked her ribs in the process (I agree, Mac should of let her drown), Adia that we know literally nothing about, Frank the old-man type who knows best all of the time, Jack the born leader, Maria the mother, Laura the presumably smokin' hot scientist, Lynn the unexperienced tough-girl who has to prove she can roll with the men, Will the nerdy, soft guy who turns tough and manly. I mean...it's almost unbearable. The story-line. The idea behind the plot was great, I thought. If the above "bad" points didn't exist and the story was more streamlined and connected, it would have been a great book. But there was just too much disconnect. I mean, why in the hell would you send a crew to a planet without first surrounding that planet with satellites and probes to provide communications and evaluation? That would have eliminated the entire situation with Jack and Will to begin with. They could have found them via GPS and retrieved them. Why not send a robot to the ground to test plants and rocks? For crying out loud, we do this in 2016 on planets. As if they wouldn't do it in another 100 years... Yet, the crew has to go out in small groups and risk their lives to get rock and plant specimens. Yes and no. Yes, I immediately thought it was THAT Arrival, and no, it's not. At first, the writing reminded me of Cathryn Asaro. Lots of blow-by-blow, pedestrian details that don't lend an SF feel. The characters are flat, annoyingly stupid ingenues. I don't mind flat characters, but inappropriately stupid is annoying, esp when they are supposedly scientists, engineers, and adventurers. So I'm not a great fan of this book. But I kept coming back at it. You ever sniff a carton of milk and it's s Yes and no. Yes, I immediately thought it was THAT Arrival, and no, it's not. But I kept coming back at it. You ever sniff a carton of milk and it's sorta off, and yet you keep sniffing it? And then you get others to sniff it, too? And you come back and sniff it even more? It's not awful, but it is off and pretty cheesy. Yes, I'm ashamed to say, I stayed with it till it to the end. Is this an SF novel? It was actually an adventure story for a long while. The SF part is a long wait and pretty silly when it arrives. The book itself actually uses the word "silly" quite a bit throughout. Hmmm. But the SF-related story does illuminate a tiny aspect of alienation, the pain of changes, and a fear of the new and unknown that actually tug on the heart strings. Would be a cool story if this pivot point had been kept and the rest done slightly differently. The audiobook narrator has a wonderful voice, and I appreciate him creating unique character voices, but I didn't like his characters. He made them silly, dull-witted, and overwrought, just like they are written. I have no idea why there are high ratings for this book. Maybe people are rating this book high thinking it’s about the movie of the same name but entirely unrelated. This book is written simplistically with little sophistication and knowledge of space travel or genetics. It reads similar to sci-fi written in the 1950s-60s. The dialog is like listening to teen girls conversing. And the reader for the audiobook makes it even more difficult to listen to with the tendency to speak like a huffy adole I have no idea why there are high ratings for this book. Maybe people are rating this book high thinking it’s about the movie of the same name but entirely unrelated. The dialog is like listening to teen girls conversing. And the reader for the audiobook makes it even more difficult to listen to with the tendency to speak like a huffy adolescent. The story really is weak and implausible and weakly explained. I had to force myself to finish this book and still had to take multiple breaks to read good books along to way just to be able to muscle my way though it. This is a somewhat unbelievable and mildly unoriginal story, but entirely captivating and well written. You enter the story with the crew of an advanced lander about to detach from a advanced probe for a generation ship heading to the first unexplored planet that humans will set foot on... But, what's this, there are technical difficulties that lead to some of the crew being separated from the others before the lander detached, and then the probe explodes! It's a little bit over-detailed, and you This is a somewhat unbelievable and mildly unoriginal story, but entirely captivating and well written. It's a little bit over-detailed, and you absolutely feel for the cast of the story. I’ve been a fan of the author’s Frontiers saga and, when I received an email from his distribution list about this work he previously wrote 25 years ago, I was interested in it and got it using a borrow under the Kindle Unlimited program. The first 75% of the book was pretty good in detailing some of the struggles of a colony effort, and while wordy here and there the book had good character development. Without having a spoiler the last 25% of the book went off of the deep end and was unbelievab I’ve been a fan of the author’s Frontiers saga and, when I received an email from his distribution list about this work he previously wrote 25 years ago, I was interested in it and got it using a borrow under the Kindle Unlimited program. The first 75% of the book was pretty good in detailing some of the struggles of a colony effort, and while wordy here and there the book had good character development. Without having a spoiler the last 25% of the book went off of the deep end and was unbelievable with what happened to the main character yet not to anyone else. This one needs some serious editing. A book full of promise, but as I finished it I was left feeling it needed more. The characters are deliberately understated, over time, fleshed out and as a result become more interested. As they become more interesting they come alive and the book starts to come alive with them. By the last third of the book they develop enough that you want to see what happens next, so read on. The pace increases and as the story moves to its conclusion, so the characters fade in impotence. Arrival works best A book full of promise, but as I finished it I was left feeling it needed more. The characters are deliberately understated, over time, fleshed out and as a result become more interested. As they become more interesting they come alive and the book starts to come alive with them. By the last third of the book they develop enough that you want to see what happens next, so read on. The pace increases and as the story moves to its conclusion, so the characters fade in impotence. Maybe is am a totally jad The Eden Project was a dream. Maybe is am a totally jaded sci-fi reader. Or it was the vocal artist. I am not sure. I hear the movie is good so will want to give it a viewing. I just can't give it more than "it was OK". This book is LONG! 18 hours of an audio book that could have been edited down to MAYBE 3. Perhaps to compensate for the extra long book, here is a truncated review. I don't know why I pushed through the whole 18 hours. There was little science an This book is LONG! 18 hours of an audio book that could have been edited down to MAYBE 3. Perhaps to compensate for the extra long book, here is a truncated review. I don't know why I pushed through the whole 18 hours. There was little science and even less investment in character development. Born in 1960 and raised on an overdose of television, NASA, and science fiction, Ryk Brown has worked as a cook, rock guitarist, stage lighting technician, and paramedic. He currently resides in Northern California with his wife, daughter, and cat. By day he fixes computers, and by night he creates stories. Having spent his entire life "thinking stuff up", the advent of digital publishing has final Born in 1960 and raised on an overdose of television, NASA, and science fiction, Ryk Brown has worked as a cook, rock guitarist, stage lighting technician, and paramedic. He currently resides in Northern California with his wife, daughter, and cat. By day he fixes computers, and by night he creates stories.